Brewing beer in your home can be as simple, or as complicated, as you want to make it. Here, we’re going to present the simple way. There is a lot of science you can get into, but we’re going to skip a lot of that as there are a lot of people who can tell you about it a lot better than we can. And they have books out (John Palmer’s How to Brew (online), and Charlie Papazian’s The Complete Joy of Homebrewing). We’d recommend reading these books at some point. You’ll learn a lot about why everything happens, how brewing really works and just a lot more in-depth information. If you want to make this a serious hobby, those are two can’t miss books. In this article, though, we’re going to run through step-by-step how to brew in a small kitchen setting. We know many of you live in apartments (we do), and we’ve heard too many people say they can’t brew because of this. You can! We know this, because we do it. We’ll show you how to go about brewing your first batch. Plus, we’re including pictures to really show you how it’s done. So, let’s get brewing! Smoked Beer Can Chicken recipe by Devon at Drink Craft Beerk (and more food recipes here). Previously: "But really, if you can make tea, then you can make beer." My last batch was an imperial IPA and I brewed, fermented, and bottled it in a tiny apartment kitchen with an electric stove (which makes boilovers harder to deal with)... I've never heard anyone say they don't brew because the kitchen is too small, just saying. Nice post, though, I love anything that makes home brewing more accessible. Couple of interesting things in this. 1) They go straight to an all-grain mash; no warm-up "just use premade extract" version. Extract just gets a brief mention or two. 2) They suggest using an outdoor burner, and I've always wondered about why people suggest it, because when I've tried brewing outdoors it takes LONGER. There's always breeze, and there's a giant 5-gallon stock pot for it to wick away all the heat, even with a lid on. What crazy burners are people using for this? Are they doing it southern California on a no-wind day? Baffling. 3) I like* how detailed the fermentation step is, where it talks about how you need to keep it in a dark, temperature-stable place, and how important that is to the kind of beer you're making. In addition to the classic books mentioned in the OP, I also have a copy of Radical Brewing by Randy Mosher on my shelf. It's a damn good read for someone who is into the hobby and wants to experiment a bit or has a historical bent. I can make tea in 3-5 minutes. Brewing beer is a much larger time commitment than going to grocery store and picking up a 6-pack of something I know I'll enjoy. Brewing your own beer requires a financial investment as well, might as well mention that. But I don't think tea analogy meant *time*, I think it was to demystify the process and say, "hey, thisi s actually more simple than you would expect" and to build confidence. What crazy burners are people using for this? People typically use the big propane burners that you'd use for a turkey fryer or for doing a crab/shrimp boil. They're very high output and will go through a 20-lb tank of propane in a couple of hours if you run them full bore. E.g. ones like this or this. The key phrase to search for is "banjo burner" or "banjo cooker". My carboys double as coat racks. It's a win/win, keeps the sunlight out, and when I've consumed a good amount of brew I can put a hat on the top and giggle at the little beer man. Back in the day (i.e.pre-Papazian) the go-to tome for brewers was Dave Line's Big Book of Brewing. A really good, informative read, that I think all home brewers should have. I brewed beer while living in an apartment, and it came out wonderfully. I used canned malt extract, which eliminates all the most difficult parts. If you want to do your own malting, on the other hand, then it's going to be very complex. We did 5 gallon batches, and it wasn't necessary to boil all 5 gallons. We'd do about 1 gallon in a big pot, with all the malt and the hops, and when it was adequately brewed we put it in our primary fermenter and filled it up with water to make 5 gallons. I don't drink any more, but if I did I'd still be brewing. I love to brew, but with so many great craft beers available in the Twin Cities these days, it's hard to justify drinking that much beer. Brewing your own beer requires a financial investment as well, might as well mention that. The financial investment is tiny though, I spent like $100 4 years ago and have made hundreds of gallons of beer (in my crappy, tiny apartment kitchen) with the same basic kit. I can't boil enough water on my terrible electric stove to do a normal sized batch of all grain so I just stick to extract/partial mash. I have friends who do the outdoor propane burner all grain ultra complicated thing who have spent tons of money on their gear, but when we do blind taste tests my extract brews generally come out on top. I mean I like the nerdy stuff too, just the logistics and time investment is too much for me in my apartment. It depends on what kind of beer you're into, but I generally brew Belgians so it's like $25-40 of ingredients per batch for the kinds of beers that sell for $10-20+/bottle. I give away a lot of beer and people are always like "This is really good, brewing must be hard!". Umm no, I invite some friends over and we get really drunk and listen to metal while we wait for things to boil. That's about all there is too it. I'm surprised that people still suggest five gallon batches for beginners/people in apartments. I brew 2.5 gallon batches, and I'm thrilled with it - it makes all grain a lot easier and cheaper since you can do brew-in-a-bag, boils faster, uses less space (though this is kind of moot for me since I have 2 2.5 gallon fermenters). It also involves less financial investment and if your beer turns out bad you're stuck with way less. Why is 5 gallons the standard homebrew size? I've stopped brewing because I've gotten tired of the commitment to drinking that much of the same beer; even if it's a very good beer (and I've made one very good beer at least) I find I get sick of it before I'm done and on to the next, not to mention the work of storing that much beer (and that many empties). When next I have a job, I plan to downsize my brewing equipment to 2.5 gallon batches and see if that's a better fit for my lifestyle; I confess I was kind of hoping this article would be about that. Apartment dwellers (and people who currently brew beer and enjoy experimenting with weird styles and stuff, and people who don't currently brew beer and are interested in a low-cost entry point) might also like the one-gallon batch. Brooklyn Brew Shop sells a kit. Why is 5 gallons the standard homebrew size? Possibly because of the easy availability of 5 gallon carboys. Back in the Carter administration days the office bottle water cooler used glass containers that more than likely found their way to the home of more than a few home-brewers. I personally do not get the appeal of all-grain brewing. There's a lot of extra steps involved, and the finished product is a lot less likely to have the exact amount of sugar and whatnot that you want for your recipe. Given how many other ways there are to customize a recipe with different hops, specialty grains, yeast and other additives, I have never felt like I was limiting myself by sticking with extract for the malt. I've upgraded a lot of aspects of my homebrew process but that's one that I don't really consider an upgrade. Also the tip that I would give to beginners that pretty much no one ever mentions is to use FermCap-S. It costs next to nothing to buy enough for a huge number of batches, and since I started using it I've had next to no problems with boil-overs or blow-offs. The other tip would be to use plastic instead of glass for a fermentation vessel although there are more trade-offs involved with that choice. I found out this weekend that I made my first batch of undrinkable beer, after four successful batches. I put cinnamon into the beer along with the bittering hops, choosing to not look at a recipe for adding cinnamon flavors. The resulting batch tastes like medicine. Its really sad. Hopefully my 1st IPA comes out all right. I'm bottling it tonight or tomorrow. Home brewing of beer is closely aligned with the home fermentation of wine, which had been going on for ages before home brewing beer was legalized. Wine makers came to use 5-gallon carboys, as they were pretty easy to "find" in most offices. When Papazian's book first came out it wasn't long after the days of nothing but Blue Ribbon malt and bags of "hops" that could be any variety and were probably leftover from Prohibition. We were lucky to have two homebrew shops in the area (that had started with winemaking) and thus only had to resort to mailorder for oddball stuff. Now the variety of malt extracts and grains available are simply mind-boggling - I recently brewed a batch with hops from New Zealand(!). We truly live in a golden age. Thorzdad, plastic is signficantly lighter than glass. A 5 gallon batch weighs over 40 lbs. on its own and the heavy glass carboy just makes it even worse. Plus if you drop a plastic carboy, it won't shatter and potentially injure you in the process. The downside to plastic is that it can scratch and those scratches can harbor bacteria that are hard to kill. The wrong ones can turn a batch of beer into vinegar or worse. I'm getting to the point where I'm considering going to plastic myself, just because it's getting harder over the years to haul a full carboy around. I just got TIPS certified in order to clear the very, very low hurdle towards hosting a beer tasting event in my library. Our function room actually has a small kitchen attached, so if this takes off, I'm hoping to do a Brewbrary Day. At the very least, it'll let me use my brewing kit that's been gathering dust since my kid was born. Hoping to get a chance to brew at least one 5-gallon batch this winter. I've still got half a dozen cases of 16 oz. heavy duty refillable bottles that I bought full of beer a quarter century ago and used for homebrew many times. You used to be able to buy cases of beer in heavy 16 oz bottles in a case made from heavy-duty wax-coated cardboard. A case of Straub pounders would set you back about $8 + $1.50 for the deposit. They were a great source for cheap homebrew bottles once you finished off the cheap domestic beer that came in the bottles and steamed the labels off. Mostly for the same sorts of reasons why every other type of beverage container is not made out of glass. But specifically for something like a 5 gallon carboy, a carboy full of liquid is very heavy, and even if you buy handles or use a milk crate or whatever they are a pain to move around. Added to that, if you ever drop one from a decent height, there's a good chance it will shatter into a bunch of really dangerous giant glass shards that can severely injure you. The one major downside of plastic is that it's easy to get scratches that can be homes for bacteria. furnace.heart in the previous thread strongly advocated 1-gallon all-grain batches and the book "Beer Craft": link to comment. We in Canada are blessed with liquid wort kits. With these, all you have to do is add yeast. Of course, you can add other stuff to your heart's content. I understand however, that the companies that make these kits might be facing difficulty due to the popularity of brew-on-premises operations. In a way, it is hard to justify home brewing now that there are so many great commercial beers that are readily available. It is really hard to come up with something at home that isn't out there somewhere. One open frontier is the domain of low alcohol beers. It is actually quite tricky to make a great beer at the 2%-4% range. One open frontier is the domain of low alcohol beers. It is actually quite tricky to make a great beer at the 2%-4% range. Indeed. I would love to find a good small beer recipe. I've given up on soda at lunchtime, and besides mineral/seltzer water there isn't a great alternative soft drink that isn't loaded with sugar or some other undesirable ingredient. Possibly because of the easy availability of 5 gallon carboys. Also gravity (no I don't mean ABV). Try picking up a container, glass or plastic, containing 5 gallons of water. Now imagine that you were trying to lift said container onto a [flimsy? I hope not] table while not disturbing the sediment buildup in the bottom too much. I'd be curious to see any other law regulating batch size. Having lived and brewed in Alabama while it was illegal on the state side made things... interesting at times and mundane at others. On reread of the comments I swore someone said something about the legality of batch size, but I'm not seeing it now... oh well. I would love to find a good small beer recipe. I've started experimenting with brown malt. It doesn't convert itself, ie. when mashed by itself, the wort will not have any sugar, and thus no food for the yeast to convert into alcohol. You do get a tasty, malty flavour from this wort which you can add to regular pale ale wort to bring down the alcohol content without watering down important flavour components. I was under the impression that fermenting at temperatures about 68F would result in off-flavors, which is why I haven't tried it since I moved to New Orleans. Was I mis-informed or is this article just assuming that if it's cheap, you'll drink it anyway. I would love to find a good small beer recipe. I've given up on soda at lunchtime, and besides mineral/seltzer water there isn't a great alternative soft drink that isn't loaded with sugar or some other undesirable ingredient. I guess this depends on whether you like sours or not, but Berliner Weisse. If the sour is too much you can pour it with a bit of syrup as is traditional. I had my partner bring back a bottle of fluorescent green waldmeister syrup from Germany but a local bar here was doing it with a hibiscus syrup they made. Ingredients wise it's very simple so it's cheap to make a batch. Depends on the yeast, if I were you I would brew saisons which are notoriously finnicky yeasts. Traditionally they were fermented in the hot months, here in the mild bay area I have to heat my carboys when doing saisons or the yeast will stall out. Brewing beer is a much larger time commitment than going to grocery store and picking up a 6-pack of something I know I'll enjoy. Learning a new skill and sharing it's fruitful results is a much more deeply satisfying and joyful experience than than paying a middle man to procure some industrially manufactured product, heavily marketed for my mindless consumption. 1. For sparging, I bought a picnic cooler (hint: shortly after labor day in the US they are CHEAP) and pulled the spigot and replaced it with a stopper with a copper tube with one end crimped and slits cut into it on the inside. This acts as a grain filter and took all of 20 minutes to make with a pair of pliers and Dremel tool (hacksaw would work too). 2. For chilling the wort, I put freeze a gallon of water ahead of time and put it in my fermenter. I pour the wort over that, top up to 5 gallons and stir to aerate. 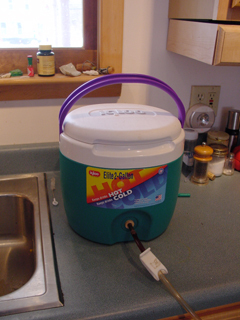 Time to fermenting temperature: 5 minutes and uses way less water than the bathtub method. No matter what you do, if you have an electric stove, buy a stock pot with as heavy a bottom as possible to prevent burning (I have a gas stove and a cheaper pot and have a little burning if I'm not careful. If I upgrade anything, it would be the pot). Thorzdad: Northern Brewer's 1-gallon kits. BLESS YOU! You just wrote my Christmas list for me, a hundred days out. w00t! In a way, it is hard to justify home brewing now that there are so many great commercial beers that are readily available. It is really hard to come up with something at home that isn't out there somewhere. I disagree heartily with this statement. I started brewing because I was having such a time finding things to my taste. It is so much easier to brew a Wiezenbock than it is to find one for starters, secondly I've been adding local california herbs and spices to my beers and ciders. I really want to brew a beer out of mountain oat and a few other native grasses. To me homebrewing is like making spaghetti. Sure you can get some tasty stuff from a restaurant, but you can make your own to your taste easily. Ignorant question: does brewing one of those one-gallon kits from extract smell? Oh, for sure. That's why I do it. I just wonder if I would have started homebrewing if the commercial beer selection was as good then as now. Believe me, I'm glad I do it and will not stop. But I'm no longer just trying to do better than the mass market lagers. I'm actually trying to compete with the best beers in the world. Fun, challenging. No Worries Mr No Robots! As an answer to your question, I'm a fairly recent brewer, as in the last 6 months. I've been working with The Flavor Bible to try and accent the flavors in my brews with adjuncts. I've been met with some great success, and my failures have been decently palatable (Making a coffee porter doesn't require a lot of coffee, to fix serve with a shot of Bailey's). As someone who has done some homebrewing but isn't really interested in it anymore, I always thought the "if you like craft beer, you should homebrew" argument doesn't hold much water. It's like me saying, "if you like well-crafted hats and scarves and sweaters, you should knit" just because I like to knit. There are tons of rewarding things about both homebrewing and knitting (and a lot of similarities in terms of being easy to start simple and get more complex/creative, as well as the time it takes to get to the finished product) but I don't consider someone to be missing out on the joys of well-made hats if he prefers to purchase ones made by others rather than pick up the needles himself. I recommend this joker's books - No affliation except a deeply personal one. I'm not sure I would ever bother to do a 1 gallon batch unless it was for some experiment. For all the effort of brewing, I want the full two cases of beer out of it. Small batches can be fun; I tried brewing cider in a pumpkin (unsuccessful) and in a bottle of apple juice I left at work over a weekend after accidentally inoculating it with yeast from some homebrew we were drinking (it measured in at 3% ABV, and turned out sparkling since we left the cap closed). I went from a two story house-- room enough for my husband to make wine and for me to make beer--to a maybe 1000 sq ft apartment (though I suspect that's being generous). We sold or gave away all our brewing gear because we simply could not find room in the new place. I got to keep my kombucha making stuff because it's more compact--except for the 16 pop top bottles I use to bottle anything I make. Believe me, if I had room to brew beer again I would be doing so, but there's no room at the inn currently. I am not an expert brewmaster, but I wonder if the extract in your kit might have spoiled. My friends and I have been brewing various things for about a year, and everything we've done has smelled absolutely delicious, like baking bread. I've heard things about the homebrew culture of 20+ years ago that suggest that the freshness of certain supplies was occasionally a bit suspect. I am drinking a pint of my homebrewed Extra Pale Ale right now, have a concord grape wine and a kombucha fermenting in my laundry room, and a sour cherry wine aging in my 'cellar' (actually an unfinished and uninsulated closet). I plan to start an Oktoberfest this Saturday. I really highly recommend brewing for pretty much anyone. It's such a fun and low-cost hobby. I also recommend going straight to all-grain if you're doing bear. I mean, if your going to use extract, I feel like you might as well just ferment sugar water (but, by all means, try fermenting sugar water. It's fun!). Oh, and for the price conscious (and the dedicated drinkers), I 'd like to point out that, after about $100 investment in equipment, it's now costing me about $1 to make a bottle of wine (plus ~4 hours of my time for a 20 bottle batch), and even less for the beer. And for that matter, knowing what I know now, if I was looking to start a new homebrew operation on a budget I think I could get buy with about $15 in equipment (provided you already have a stove and a pot). I brew using extract/partial boil in 5 gallon batches using an electric stove, in a small kitchen. It has been nothing short of very tasty, every time. I might try all-grain mash now, using this article as guidance. Nope. I've been working at breweries in San Diego for five years, and the vast majority of beers we make down here are fermented at exactly 68 degrees F. Lagers will be cooler, some Belgians a little warmer, but 68 is the sweet spot for the vast majority of ale yeasts. Used to homebrew before I started working at a brewery. Sold everything last year. The last thing you want to do after work is more of the same. Now cheese and sausage making, on the other hand.... I don't know why those haven't caught on as much as homebrewing. I'm an all-grain brewer (and I kicked off my first 100% Brett batch last weekend, so I'm way down the rabbit hole) but I think it's only worth doing if you really enjoy the hobby. Extract is super easy though, so it's worth a shot if you're interested at all in trying it. 2. It's basically the same amount of work to brew 5 gallons as 2.5 gallons, might as well do as much as you can with your equipment. Do all of you who think 5g is too much brew alone? I pretty much always brew with a partner, we take turns buying ingredients and split all the batches. If I do a batch by myself I just give it away or show up to a barbeque with a case, everyone loves beer. Five gallons is only two cases and the beer lasts for months. I usually buy at least a case a month for my own consumption anyway. I'm just starting to look into home brewing, and for anyone else looking to start, check out your local brick and mortar home brew store. My local store is run by an older couple, probably semiretired. They have kits for both hardware and ingredients, and are extremely friendly and helpful. The big thing they told me is that they offer in store brewing. I can buy the ingredients and bottles, and use their equipment, and they will even help me with it. I think that's awesome, as it is going to let me do my first home brew project for about $60 and get 48 bottles of beer out of it. I'm told most local brew shops are pretty similar, guys who took the next step in their own hobby. burnmp3s: "I personally do not get the appeal of all-grain brewing. There's a lot of extra steps involved, and the finished product is a lot less likely to have the exact amount of sugar and whatnot that you want for your recipe. " Yes, all grain takes longer and requires more equipment, but it actually gives more control than extract brewing. Extracts seem to vary quite a bit in fermentability, but by controlling mash temperature the brewer can make the finished beer more or less sweet (dry) as desired, instead of guessing what the extract manufacturer did (or figuring it out and then religiously buying the same type and hope they don't change their process). It also seems impossible to make a very pale beer as the extract is inevitably darkened somewhat in manufacturing. Then there is the whole thing about having to use fresh extract, as it spoils more quickly than malt. A huge benefit if you brew much is that all-grain can be much cheaper in the long run. I buy malt by the sack for as low as around $35 for 50 pounds, and that makes a lot of beer. ok this is really cool! Can anyone point me in the direction of a guide specifically about ciders? That is my drink par excellence, and with cider season right around the corner, I am excited! Rebent - depends on what approach you want to take. I wrote the Everything Hard Cider book last year with the point of view of helping folks make decent cider from commonly available ingredients. This is slightly different than the traditional tack that says "If you want good cider, you must start with good cider apples. In order to get good cider apples, you typically have to grow them because they're not commonly commercially available"
If you want a book that is more traditional in approach, I really appreciate Andrew Lea's no nonsense traditional approach. His is a very English-centric impression, but so are most of the ciders we drink in the US. The completist guide to everything world wide, but still very much in the "grow your own tress" model is The New Cider Maker's Handbook. I’ve been doing this for a while, ever since I came across a copy of the Brooklyn BrewShop’s “Beer Making Book”. I don’t drink much nowadays but *do* enjoy a good beer, and doing a gallon at a time has proved just right, and gives me room to experiment. I’ve so far got repeatable recipes for an IPA, a black IPA and a porter, and the black IPA is very close to BrewDog’s Libertine. Oh, and if you do all-grain brewing rather than use extract, don’t throw the spent grain away: dry it in the oven and use it for baking. Oh, for the interested but not *that* interested. Mead is the easiest thing out there to make into an alcoholic and enjoyable beverage. If you're looking for the lowest barrier of entry, a gallon recipe of that may well be it. I give you my previous rant saying as much. I was just pondering making a gallon batch of mead! I've always wondered why the standard is 5 gallon batches. When I lived in a larger apartment I would brew 5 gallon batches on my fire escape fairly often, at least once every two to three weeks. Now that I'm in a smaller apartment with a tiny (seriously tiny) kitchen and no fire escape, I now do one gallon batches and I actually brew more often and have more beer than I did when I was brewing on the larger setup. I find brewing on the smaller setup easier. When I did 5 gallon brews I needed someone else to help me carry the keggle full of wort into the bathtub to chill, or help me untangle the garden hose to use the immersion chiller - now I just pick the pot up, turn around, and dunk it in a sink full of water all by myself. It's great! the vast majority of beers we make down here are fermented at exactly 68 degrees F.
Arg, I just noticed that I type "about" instead of above. In CA I had a cellar that would consistently stay below 70F, at that worked fine. Here in NOLA the house temp ranges from 76-78, well _above_ 68F. That was my worry.